From the lab to the clinic and back, Winship experts are pushing to stay one step ahead of the "Big C"
Life is Good: Oncologist Taofeek Owonikoko (right) used new immunotherapy drugs to help Lorraine Harris (left) overcome aggressive, recurrent lung cancer. Now she is enjoying her grandchildren. Before his diagnosis of stage 4 metastatic lung cancer at fifty-nine, Ed Levitt had been a runner—proud of never needing a sick day, never missing a workout. The closest he ever came to sick was when a local doctor diagnosed a severe pain in his side as kidney stones and sent him home to urinate in a strainer. No kidney stone appeared, but the pain went away. When it suddenly reappeared, a year later, it brought Levitt to his knees. A different doctor looked at his scans and told him he had six weeks to get his affairs in order. Levitt, a sales director for Home Depot, had lots of business savvy but knew little about medicine. A neighbor insisted he call Winship Cancer Institute, an hour’s drive from his home in Acworth. Levitt was placed on standard, state-of-the-art chemotherapy. It didn’t work. But Georgia’s only National Cancer Institute–designated comprehensive cancer center has earned a reputation for seeking, and finding, new ways to defeat the second-leading cause of death in the United States. 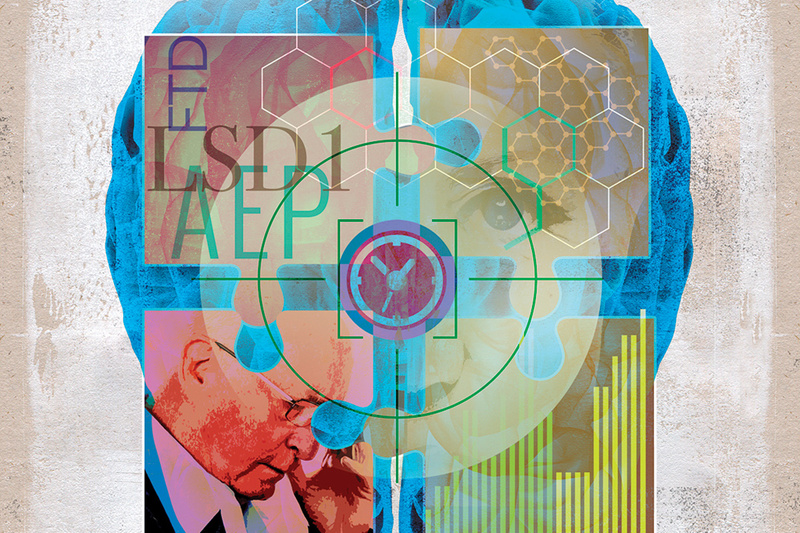 Levitt began a decade-long marathon of experimental treatments, taking advantage of Winship’s multidisciplinary clinical team and 250-plus active clinical trials. Whenever his cancer edged ahead, a different treatment pushed it back, simultaneously adding new knowledge to help both him and patients in the future. In 2004, after chemotherapy failed, Levitt was among the earliest patients to receive gefitinib (brand name Iressa). At the time, clinicians and study investigators did not fully understand why his response to the new drug was so positive—tumors shrinking, pain gone, “my old normal back”—while other patients did less well. Subsequent testing and studies showed that drugs like gefitinib get their power from inhibiting a mutation in the epidermal growth factor receptor (EGFR) gene. In healthy cells, EGFR allows healthy cells to grow, divide, and replace worn-out ones. In cancer cells, a mutation in EGFR allows—even encourages—their uncontrolled growth. Genetic screening showed Levitt’s tumor was positive for the mutation, found in some 15 percent of NSCLC patients in the US. That provided a target for an evolving class of “precision” drugs aimed at specific mutations. 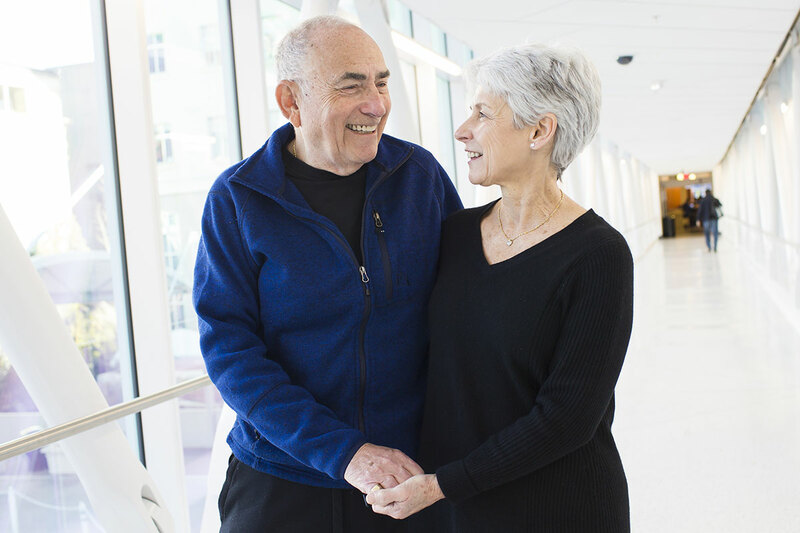 Taking Our Time: Winship patient Ed Levitt (left) with his wife, Linda Levitt, has benefited from immunotherapy drugs that have kept his stage-four lung cancer at bay for nearly fourteen years. Levitt says Linda has been his champion: "If it weren't for her knowledge, understanding, and tenacity, I would not be alive today." Taofeek Owonikoko, professor in the Department of Hematology and Medical Oncology at the School of Medicine and cochair of Winship’s Clinical and Translational Review Committee, believes another reason Levitt did well was the Winship team’s willingness to think outside the box. Surgery is generally not used for metastatic lung cancer, but Levitt’s case was unusual. His widespread cancer was responding to gefitinib everywhere except his adrenal gland. In 2008, surgical oncologist and professor David Kooby removed the adrenal mass, providing fresh tumor samples to use in emerging genetic testing that could predict the reason for treatment failure. But it was working for Levitt. When Iressa was taken off the market, Fadlo Khuri, a former Winship oncologist and chair of the Department of Hematology and Medical Oncology, wrote a single patient protocol so that Levitt could continue to receive the drug through a special access program from the company, under direct FDA supervision and oversight by Winship’s safety committee. The drug continued to hold the cancer back until 2011, when the only growth was in his lymph nodes. 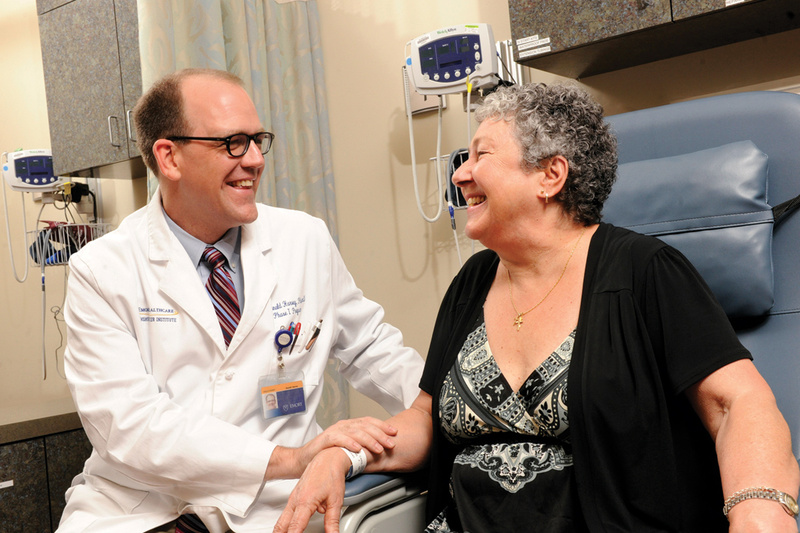 Surgical oncologist Keith Delman, professor and vice chair of education in the Department of Surgery, removed them, and Levitt returned to his active life, with regular scans and occasional radiation. By April 2016, though, cancer was in the lead again—the drug stopped working. Levitt was a lucky exception; most patients develop resistance to gefitinib within two years. Now Owonikoko enrolled him in an international trial of a new, more advanced EGFR inhibitor: AZD9291 or osimertinib, brand name Tagrisso. 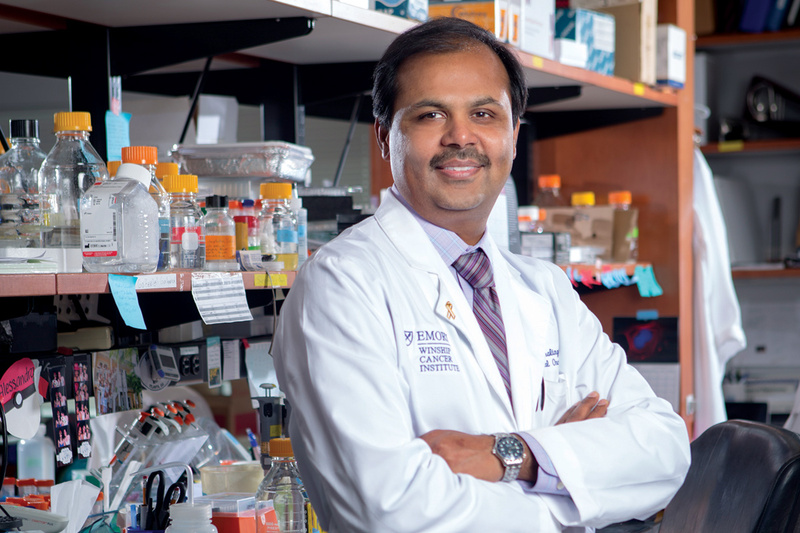 Zeroing In: Suresh Ramalingam, director of Winship's lung cancer program, has led development of "precision" drugs aimed at specific genetic mutations. At the conclusion of the trial, led by Suresh Ramalingam—professor in the Department of Hematology and Medical Oncology, Roberto C. Goizueta Distinguished Chair for Cancer Research, and Winship deputy director—patients taking AZD9291 had significantly longer progression-free survival with lower rates of serious adverse reactions. The subsequent FDA approval was hailed as a new treatment paradigm for EGFR-mutation-positive patients—and a second chance for those like Levitt who had begun resisting earlier inhibitors. But the very nature of cancer is to change. Eventually osimertinib went the way of its predecessors. Ramalingam and Owonikoko turned to their basic-scientist colleague, Shi-Yong Sun, Winship professor of hematology and medical oncology. An expert in the biology of cancer, particularly the pathways involved in the survival and growth of cancer cells, Sun had a personal interest in resistance. His wife’s mother had died after her NSCLC stopped responding to a previously effective EGFR inhibitor. And he—an internationally known cancer researcher for more than twenty years, working with renowned clinicians at a top cancer center—did not know why. No one did. To find the resistance-causing mechanism, Sun exposed human cancer cell lines with the EGFR mutation to gradually increasing dosages of AZD9291. As in patients, once-sensitive cells eventually became resistant. Comparing the before- and-after cell lines revealed excess expression of a cancer-causing oncogene called MET, another mutation found in 5 to 20 percent of NSCLC patients. When Sun added a MET inhibitor to AZD9291, the combination began to kill cancer cells again. But what about the majority of patients without this particular mutation? Thanks to Sun’s lab, emerging understanding of the cascading biological signals that lead to cell survival or cell death may o¬ er a solution. Since MEK and ERK proteins in this signaling pathway inhibit cancer cell death and promote cancer cell growth, Sun found that adding MEK/ERK inhibitors to the drug overcame acquired resistance, at least in cell cultures and in mice with tumors from EGFR-mutant NSCLC cells resistant to the drug. He believes this therapeutic strategy will work no matter what mutations or mechanisms are involved. 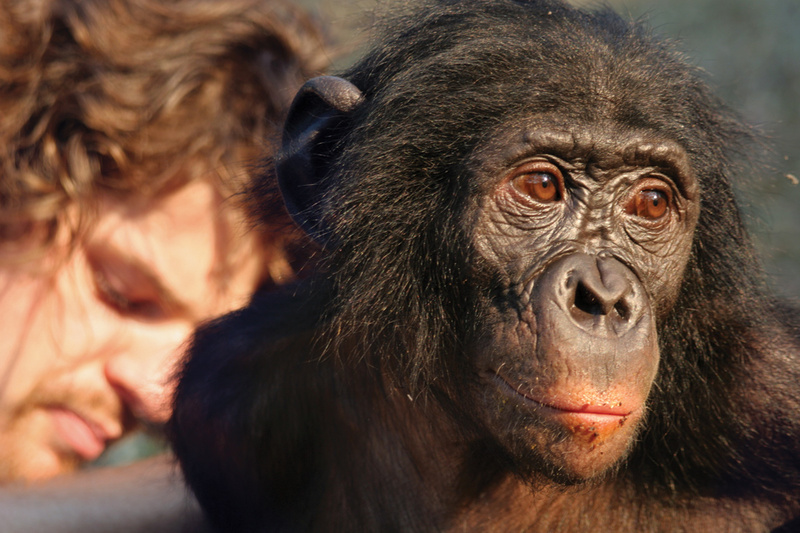 After observing both positive response and safety in tissue and animal studies, Sun, Ramalingam, and Owonikoko are now designing a Phase I clinical trial using existing drugs. Later, they plan to work with longtime collaborator pharmacologist Haian Fu, head of the Emory Chemical Biology Discovery Center, to screen thousands of compounds to find one that could be optimized to take a different, potentially even more powerful approach. When gefitinib no longer worked, and when side effects sidelined him from the new EGFR-inhibitor trial, Levitt immediately agreed to participate in another one. Until then, the drugs being tested had been designed to inhibit the effect of specific genetic mutations: targeted therapy, also known as personalized or precision therapy, one of the fastest-moving areas in cancer research at Winship and other leading centers. Now Levitt moved seamlessly into the other rapidly advancing area: the world of immunotherapy. In the past, patients with EGFR-mutation- positive lung cancer were not considered good candidates for immunotherapy drugs like pembrolizumab (Keytruda), which help the immune system get back on track by blocking a receptor that turns it off. Ramalingam and others believed adding a drug like entinostat to Keytruda could change that. Entinostat selectively targets and attacks enzymes involved in tumors, upsetting their biochemical environment and paving the way for immunotherapy. Entering the combined Keytruda-entinostat study also meant Levitt had now participated in the full scope of clinical trials. It was one of thirty Phase I trials under way at Winship, half of them in immunotherapy, designed to determine if a new treatment—already tested in cell cultures and animals—is safe to use at a range of dosages in humans with different types of cancers. Phase II looks at how well the treatment works for a certain type of cancer, and Phase III compares it with standard treatment. “We wouldn’t have the treatments we do today if people like me weren’t willing to try new drugs in trials,” says Levitt. A decade ago, Phase I studies were considered last-chance efforts, good at determining the best way to administer a new treatment but not so great at providing clinical benefit. That has changed markedly, says Donald Harvey, director of Winship’s Phase I Clinical Trials Unit. A Better Chance: Donald Harvey, director of Winship's Phase I Clinical Trials Section, says trials are no longer last-chance efforts that provide little clinical benefit. A growing number of Winship patients in Phase I trials have seen improvement or extended periods of disease stability for more than five years. Today, cancer is beaten back or held steady for more than one in five patients in these trials. At Winship, a growing number of patients on Phase I trials have seen improvement or extended periods of disease stability for more than five years. Sometimes a drug tested in Phase I is so obviously successful that it is fast-tracked for FDA approval without going through Phase II and III trials.Donald Harvey, director of Winship’s Phase I Clinical Trials Section, says trials are no longer last-chance efforts that provide little clinical benefit. A growing number of Winship patients in Phase I trials have seen improvement or extended periods of disease stability for more than five years. The reason for this begins in the laboratory, says Harvey, with a deeper, more complete understanding of the molecular biology involved in cancer and the immune response—and the development of drugs based on that understanding. This approach drives Sun’s work with resistance- based therapies as well as numerous other partnerships between laboratory researchers and clinicians at Winship. Donald Harvey, director of Winship’s Phase I Clinical Trials Section, says trials are no longer last-chance efforts that provide little clinical benefit. A growing number of Winship patients in Phase I trials have seen improvement or extended periods of disease stability for more than five years. Gregory Lesinski and Bassel El-Rayes, codirectors of Winship’s Translational Gastrointestinal Malignancy Program, have begun a Phase I trial at Winship to test a way to enhance immunotherapy for pancreatic cancer—one of the most devious and deadly of cancers—and colon cancer, one of the most common. A process called methylation turns off, or silences, genes that suppress tumors and repair DNA. When the team added a small molecule tested in Winship’s GI oncology lab to tissue cultures and mice with human pancreatic tumor cells, it turned the helpful tumor-suppressing genes back on.Donald Harvey, director of Winship’s Phase I Clinical Trials Section, says trials are no longer last-chance efforts that provide little clinical benefit. A growing number of Winship patients in Phase I trials have seen improvement or extended periods of disease stability for more than five years. Cell biologist Adam Marcus’s Winship laboratory has studied how the LKB1 gene mutation, found in 15 to 25 percent of patients with adenocarcinoma, a common form of NSCLC, increases the likelihood of metastasis and recurrence. The first step was discovering that the mutation causes overactive cell adhesion, an important step in metastasis. Second was demonstrating that a molecule to normalize adhesion lowered metastasis in mice with LKB1- mutated adenocarcinoma cells.Donald Harvey, director of Winship’s Phase I Clinical Trials Section, says trials are no longer last-chance efforts that provide little clinical benefit. A growing number of Winship patients in Phase I trials have seen improvement or extended periods of disease stability for more than five years. Now, after twelve years of collaborative research involving Marcus, Wei Zhou, and other Winship translational scientists in cell biology, genetics, and drug development, as well as Ramalingam and pathologist Gabriel Sica, the team is gearing up for the first-ever clinical trial designed specifically for lung cancer patients with the LKB-1 mutation. Participants in the Phase I trial, headed by Ramalingam, will receive standard-of-care chemotherapy plus the molecule that prevented or reduced metastasis in mice. The trial also will determine if treatment has different effects depending on the location of the LKB1 mutation, increasing treatment personalization.Donald Harvey, director of Winship’s Phase I Clinical Trials Section, says trials are no longer last-chance efforts that provide little clinical benefit. A growing number of Winship patients in Phase I trials have seen improvement or extended periods of disease stability for more than five years. Two years ago, when Lorraine Harris got the news that her NSCLC had returned with a vengeance, she told Owonikoko that she didn’t want to go through chemotherapy and radiation again. The treatment had bought her almost three welcome years. But with cancer growing rapidly in her lungs and lymph nodes, what could she realistically expect? “Dr. O,” as she calls him, gently reminded her that Winship is always developing and testing new treatments. And then Harris learned that she was going to have a granddaughter. Her story began in 2015 with pain in her back. At her local hospital, she expected pain pills. Instead, she got tests—and a litany of diagnoses. Gallstones. Brain aneurysm and aortic dissection (a tear in the large blood vessel branching off the heart). And a mass in one lung, almost certainly cancer. She was referred to Emory University Hospital, where the life-threatening heart condition was the first order of business. That resolved, Winship interventional pulmonologists took biopsies and confirmed metastatic NSCLC. After six weeks of radiation with radiation oncologist Kristin Higgins and weekly infusions of carboplatin and paclitaxel chemotherapy with Owonikoko, her tumors began to shrink. For three-and-a-half years, the standard treatment kept Harris’s cancer in check. And then, suddenly, it didn’t. In March 2015, a CT scan showed cancer in Harris’s other lung. The nodules in both lungs and lymph nodes kept growing. In the past, she would have had few options beyond palliative care. Advances in immunotherapy have changed that, something in which Winship takes special pride. The new immunotherapy drugs that unleash a patient’s own immune system are built on groundbreaking discoveries led by Emory and Winship scientist Rafi Ahmed, whose titles include director of the Emory Vaccine Center and Georgia Research Alliance Eminent Scholar. These advances have become a widely noted example of what can happen when basic science research joins forces with a leading clinical center. Ahmed wasn’t thinking about cancer when he began studying why specific immune cells, called T cells, responded so well to acute infections, attacking and remembering the pathogens responsible, but did so poorly when it came to chronic infections like hepatitis or HIV. Ahmed and then-graduate student Dan Barber 06PhD discovered that chronic infections kept stimulating the T cells, turning the immune response on. But the infections also increased levels of a receptor and a protein, PD-1 and PD-L1, that interacted to turn the immune response off. This continuous on-off cycle exhausted the T cells, putting the brakes on the immune system. But blocking the PD-1 receptors allowed the tired T cells to rev up again. Cancer researchers, in turn, leveraged that finding to eventually discover that, sure enough, cancer cells had figured out how to produce high levels of PD-L1, tricking the immune system into turning off efforts to kill them. That led to development of PD-1-blocking drugs that could release the brake, restoring and enhancing T cells’ ability to fight the cancer. Ahmed thinks about cancer a lot now. His lab recently identified the specific type of T cells that respond to PD-1 therapy; together, he, Ramalingam, and Owonikoko are exploring how to use this finding to develop more effective therapies, with a clinical trial in the works. The drugs that block PD-1 were developed elsewhere, but Winship doctors have been involved in clinical trials for these and almost every immunotherapy drug approved by the FDA. 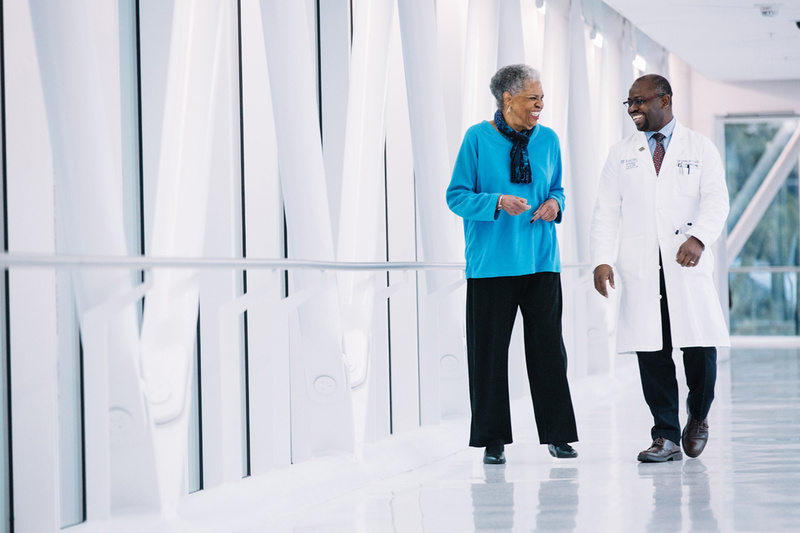 Before drugs like nivolumab (Opdivo) and pembrolizumab (Keytruda) were available outside of research institutions, Winship patients were benefiting from them. Ramalingam led one of two clinical trials that were the basis for FDA approval of Opdivo in advanced NSCLC. That light turned green just months before Harris’s scan. Her biweekly Opdivo infusions were not difficult; she chatted with Winship nurses and crocheted caps for patients who had lost hair during chemotherapy (her own stayed in place). Within months, her cancerous nodules had shrunk to less than five millimeters. In November, after two years of treatment, she returned for scans every three months; after her most recent appointment, Owonikoko stretched that number to four. She’s using the extra time to travel and enjoy her granddaughter and even newer great-grandchild. Harris also participated in a clinical trial of blood-based biomarkers, designed to compare patients’ biomarkers with their outcomes to better predict who will respond to different therapies and how to turn non-responders into responders. For Levitt, participation in the same biomarker study proved both a contribution and an opportunity. During his Phase I immunotherapy trial of Keytruda, he developed right side weakness that proved to be caused by the spread of the cancer to his brain. The trial’s strict guidelines meant he had to drop out, but the drug had already done its job by turning on his immune system. The brain mass removed by neurosurgical oncologist Jeffrey Olson contained only a small amount of cancer— and a large number of immune cells aggressively attacking it. Since Levitt’s biomarkers indicated he was likely to keep benefiting from immunotherapy, Owonikoko placed him back on treatment, outside the trial, and Winship Executive Director Walter Curran, an internationally recognized expert in advanced lung cancer and malignant brain tumors, planned and delivered Levitt’s fifth course of radiation treatments. Levitt, now seventy-five, says he considers being alive a badge of honor. 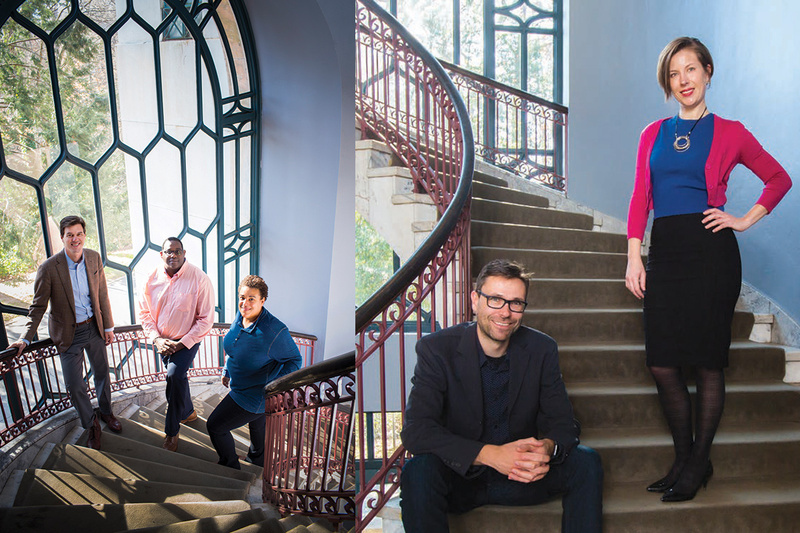 What makes Winship a research powerhouse, according to Kimberly Kerstann, are its 355 clinicians and basic, translational, and population scientists, working together. Kerstann’s job as senior director for research administration is to make sure they have what they need to implement their discoveries. 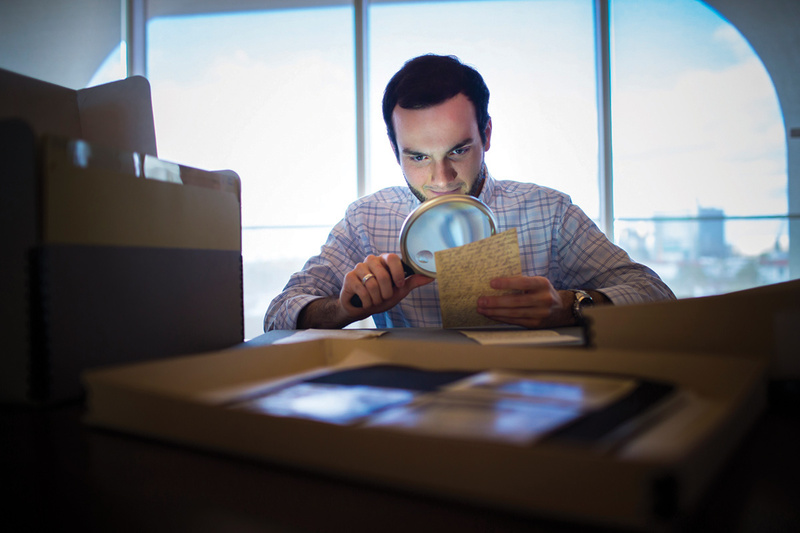 Money helps, and Winship has a robust pilot grant program to support its investigators’ novel ideas. Those early grants provide the critical funding to collect the data they need to be able to compete for more substantial federal and other funding, last year a total of more than $87 million in grants from NCI and other sources that fund 436 cancer research projects. What also helps, she says, are the shared resources and core facilities that provide access to sophisticated equipment and technology that individual investigators would find it difficult to afford, acquire, and maintain and that provide high-level expertise in specific areas. These Winship cores are basically small businesses where researchers can apply for services, such as data analysis and management, or rent needed equipment by the hour, making their own research funding go further. While Winship makes its cores available to any Emory scientist working in cancer, it also benefits from programs like the Emory Chemical Biology Discovery Center, a nationally funded facility also supported by Winship. When investigators studying the biology of cancer find a target—a genetic change promoting cancer growth, for example—the center’s robot-assisted high throughput screening allows them to screen thousands of compounds in minutes, looking for any with the potential to reverse those changes.